﻿ Learn how to enrich your media returns without risking capit﻿al. Imagine if every TV show, feature film, or video game returned all production costs and provided profits without any box office return, up-front ad dollars, DVD, or software sales. Media, gaming, film and TV shows no longer have to be "hits" to protect investor's principal. Geneva Media recaptures 100% of qualified production expenditures for studios, networks, game developers and independent producers. This eliminates all down﻿side risk for hedge funds, equity investors and banks who wish to fund capital intensive North American media. CLICK HERE to le﻿arn more --or-- keep reading below for details on our CAIC process. For those producers involved in TV or CATV content development, read more HERE. CLICK image to review our slide presentation for a SAMPLE $200mm slate with principal protection. Geneva Media can custom design structures that guarantee 100% cost recapture, and can provide contractually-based minimum returns on any slate financing arrangement (SFA), or special purpose vehicle (SPV), using proprietary structures, products and/or tax incentives. The Paramount Melrose II slate, was intended to benefit both the studio and fund investors, but instead has resulted in a large settlement . The revolutionary CAIC structure was created by Geneva Media's CEO after learning that Wisconsin-based Stark Investments had placed more than $525mm into motion picture deals under the guidance of employee, Ben Waisbren and consultant, Ryan Kavanaugh. It is now believed that investors have sustained hundreds of millions in losses after many of these films (click IMDB links below) performed poorly at domestic and foreign box offices. Geneva Media provides that regardless of profits, no arrangement will ever risk the funder's equity, loan or assets, nor the health, welfare or financial security of cast and crew members. 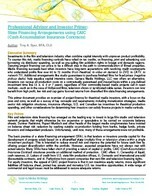 CLICK image to review our CAIC primer document. The structure is NOT "insurance-backed" media financing. Geneva Media does NOT use "credit enhancement" or P&C "insurance wrappers" which have failed to protect both equity investors and bank institutions in the past (read more about past lawsuits with AIG/AXA). The Geneva Media structure does NOT use Bank Owned CAIC when providing benefits. See more about the recent considerations of such benefits paid back to JPMorgan-Chase rather than their employee's families. Geneva Media protects families and workers and can set up CAIC as a 162 Bonus, direct ownership or as a split-dollar plan between talent or management agencies, TV networks, studios, independent producers or directly with film financing investor clientele using secular trusts or collateral assignments under restrictive bonus arrangements. Note: CAIC is NOT intended for the benefit of investors, banks, studios or networks directly.